William “Bill” Earhart (18? ?-1896) – A cowboy and gunfighter, Earhart was born in Jack County, Texas. By 1883, he had moved to New Mexico with two friends named Jim and Clay Cooper. In 1888 he became embroiled in the Lee-Good Feud of Tularosa. The Coopers were friends of Oliver Lee who was in the midst of a dispute with cattleman, John Good. In August, 1888, John Good’s son was killed by five men near Las Cruces, New Mexico. One of the killers was said to have been Bill Earhart. Later, he made his way back to Texas, where he hooked up with the likes of Killin’ Jim Miller and John Wesley Hardin. In the early 1890’s Jim Miller was in a dispute with Pecos County Sheriff Bud Frazer and his brother-in-law, Barney Riggs. Riggs. However, when the pair were in a saloon in Fort Stockton muttering threats against Barney Riggs, they were overheard. Later, they left for Pecos, Texas to seek out Riggs. In the meantime, U.S. Deputy Marshal Dee Harkey wired a telegram of warning and when they arrived Riggs avoided them. But, on the morning of March 3, 1896, as Riggs was substituting for a friend as a bartender in R.S. Johnson’s Saloon, he was alone. Denson and Earhart burst into the room and a shot from Earhart grazed Barney, who instantly fired back killing Earhart. Riggs then grappled with Denson before he was able to flee. 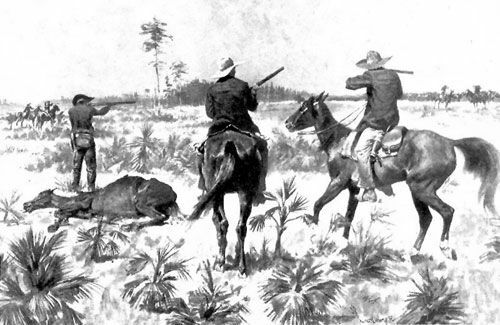 followed and as Denson was running away, he shot him in the back of his head, killing him on the spot. Afterwards, Riggs surrendered himself and though tried for murder, he was acquitted.